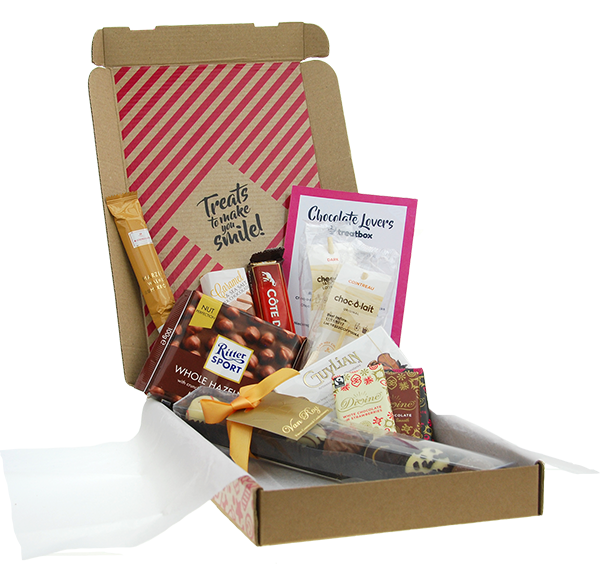 Whether you are a lover of traditional sweets, quality chocolate, candy, liquorice, full bars of chocolate or Belgian chocolates, there is a treatbox for you. An indulgent chocolate gift hamper that contains scrumptious chocolatey treats from across Europe. Our Chocolate Lovers’ Treatbox will contain chocolate from some of the best and most highly regarded chocolatiers in the world such as Divine, Ritter, Cachet, Guylian, Belgid’Or and Niederegger. 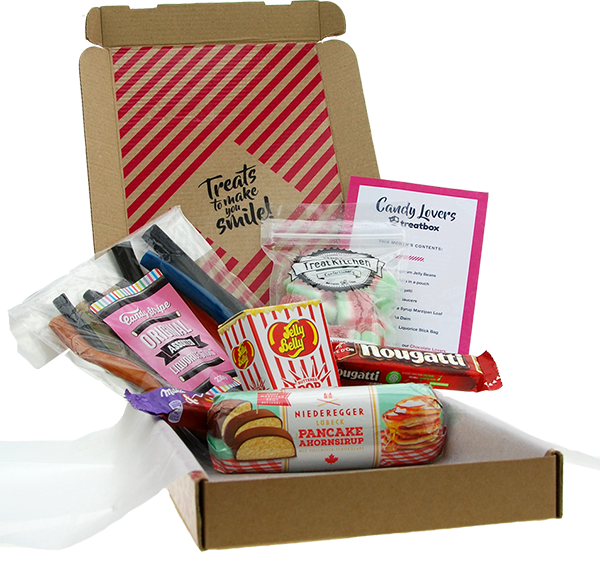 What delights will your first Treatbox contain? What’s in each candy gift hamper? No one can tell! Will it be all-time favourites jelly beans from Jelly Belly? Delicious Candystripe licorice? Tasty Niederegger marzipan? Decadent Carte D’Or Nougatti? Or perhaps you might receive some of your favourite traditional boiled sweets that you used to pop to the corner shop to buy as a child. Contents will vary each month, image is an example of what you will receive. 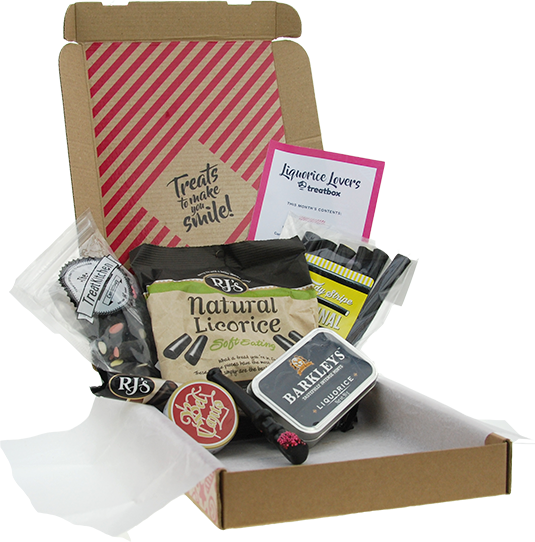 Each month, subscribers to our Liquorice Sweet Gift Box Treatbox receive a box bursting with different Liquorice flavours from across the globe. Perhaps it will flavoured or dipped, sticks or swirls. We even offer Liquorice logs with a chocolatey filling – now there’s something you HAVE to try! Remember the retro sweets from our youth? Fizzy Cola Bottles, Mini White Chocolate Jazzies, or maybe Cola Kubes from the pick'n'mix? Rosy Apples, Dolly Mixtures or Bonbons? Or perhaps it will be something completely different? You won’t know until you open up the box and look inside! 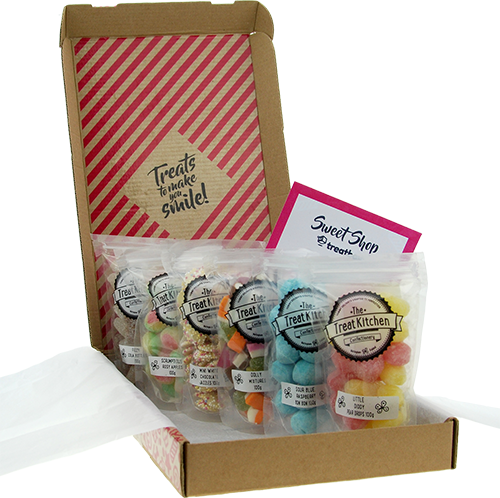 A Retro Sweet Treatbox every month, through the post, you will receive a delicious selection of childhood sweet treats made up of six 100g bags; but exactly what you’ll get in each box is a complete surprise! Remember, you can swap between treatboxes when ever you like, pause a subscription or even send a treatbox from any given month to a friend. We are flattered that you guys love what we do... it's all a bit embarrassing really! "I absolutely adore my monthly treatbox!! Every time a new one is delivered, it’s like my birthday all over again!" "The sweets are absolutely fantastic. I keep them in my office drawer... ssshhh don't tell anyone." "I love treatbox; the quality and quantity of what is included, and best of all is that I get to try treats and brands I haven't before."